Women love it because it gives a slimming effect. Every lass has their perfect little black dress. So is black only so well loved in the fashion world? I would think it so, because I know most people would think twice before putting into their mouths something as black as the deepest shade of charcoal. Ask yourself – are you someone who think of black as a dirty colour, when it comes to food?Think squid ink pasta, think buah keluak… and I’m sure you know what I mean. Somehow the age-old saying of ‘don’t judge a book by its cover’ just comes into my mind. I think it’s best not to get too judgemental over the appearance of that black or grey coloured food. More often than not, most of it tastes better than you think. Perhaps its about retuning your colour radar. Don’t be so scared when you see something as stark as black. Trust me, it’s for the best. Just like how I really adore my black foods like squid ink pasta, buah keluak and most recently black sesame. 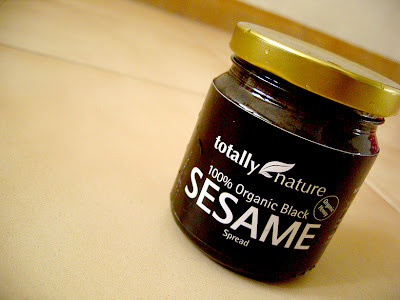 This black sesame spread that I found some time ago in Takashimaya might be the next best thing after nutella. This organic spread is mixed with organic honey and tastes really great on crackers. It has this nice balance of flavour – the sweetness from the honey complements that toasty hint that envelopes the black sesame. Not very complex but not that easy, that’s what I’d describe the spread. I really love it. Black sesame spreads are my favourite! You can get non-organic ones from the Japanese supermarkets. I meant to go to some of the organic food stores (Asian-oriented) while I was in Singapore but didn’t make it in the end. Missed out on getting good things like this. Have you tried I-Meidiya’s (Liang Court jap supermarket) honey black sesame spread? Is this totally nature’s nicer than that? Yah it’s still there at Takashimaya. It’s under the escalators, facing the check out counters of Cold Storage. They have so many flavours. I was tempted. Hmm.. I asked the sales person, he says today (24 feb) is the last day at taka. hey there! thanks soo much for letting me know. i was there on Friday and got myself a bottle! anyone tried the others? i think they have almond chocolate. but somehow i think hazelnut is the perfect nut for chocolate. haha. jy: hmm i haven’t tried any other black sesame spead brands though. but i really like this one! argh, my post couldnt get through. anw i went down to get a bottle of the low sugar black sesame spread and the almond spread. the river valley address is the factory i guess. I love buah keluak and black ink squid pasta. 🙂 I have not tried this black sesame though. My little one loves black sesame. She might just like this. Hi! Nice blog….and you’ve been tagged! you can get it from NTUC. They have hazelnut spread too. The product is from Australia.